Instead of continuing to clutter up the last minute thread with 'such fixeh' I reckon its best to have a thread for these rides. 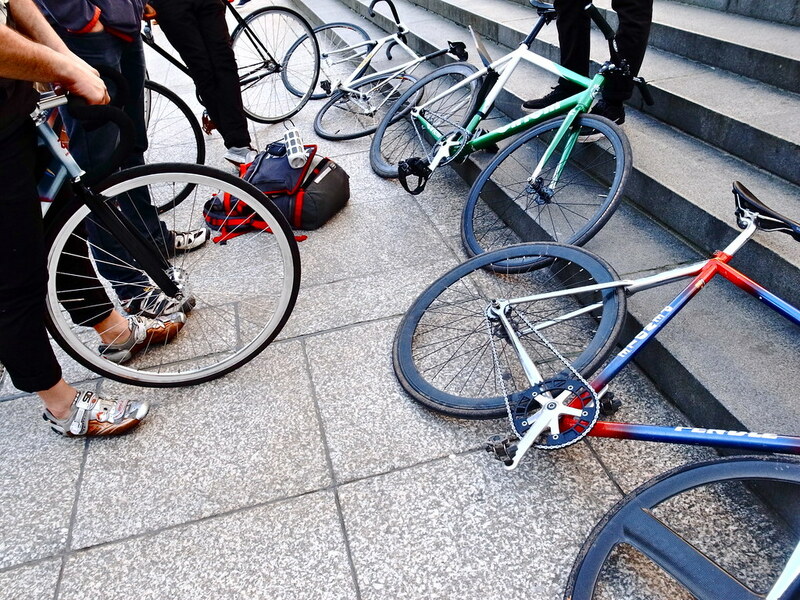 A group of us have started to meet every couple of Saturdays at St Pauls for fixed rides in and around the city, and anyone is welcome to bring along their sweet fixeh/ss. -Meeting time tbc normally the day before. Could be 2pm could be 8pm, who knows. -Rides are (quite) fast paced, but any capable rider is welcome. -Routes are democratic, I've planned the first few, but I'm happy for anyone who wants to take the reigns for the week to erm take the reigns. Rep to everyone who came down last night. Was a good night, with some new faces. Getting schooled by pavement gangster mountain bikers in peckham made my night. Where next week? West London, Thames Clipper? Lucy's city route? Discuss. If you can do Sat night I can finally make one of these. i'd be happy to try my route out, bannon very kindly mapped it out for me. it's about 15miles but there are like... at least 10 stops. could obvs make these co-incide nicely with beer stops and i can tell you fun facts about where we've stopped. maybe next sat? bannon and i will try it out this week. ^If your ready, we'll do that. And if not we can go sort of west round some parks and do Sven's favourite hill climb. Down for this Saturday night again! I'm in! And I'm happy to do a Route of my quickest ups and my favourite downs if need be. I'm well up for Lucy's route doh! Finally off on Saturday - I am IN! Might be off the work hopefully! If yes, defenitly joining a ride! I can test with you tonight? If not, I'll sort something out with Sven and we'll go parks and west. You were going to ride a road bike for a 15 mile ride with 10 stops?! Will be in for future rides, off to Liverpool tonight for the weekend though. I was going to ride the Edwardes with the disc and the spok. Silly fixed. Silly road wheels don't require a 90° bend to get air into them. Use your minds, foxy.